The economic climate and double dip recession has made window cleaning more and more of an attractive proposition for people looking at supplementing their income or for those wanting a career change, particularly after a redundancy. The window cleaning industry is experiencing a high surge of new window cleaners from all areas and all backgrounds. This will only increase over the next 12 months as the lack of money and the high cost of living continues. Nowadays, to become a safe window cleaner, purchasing a water fed pole system is more affordable than it once was. Whereas some ‘newbies’ from the ‘redundancy’ group or those that manage to find a few hundred pounds in order to get kitted out at the lowest cost, there will be many more that borrow a set of ladders and then spend £40.00 on a squeegee, applicator and some scrim. Some window cleaners will say that they have a loyal customer base and some will say that their service is a good one and one they have provided to their customers for many years. It is true, that to win your window cleaning customer from you, it can be a tough, tall order. However, we are in tough times and now is not the time to be complacent. The trend is more window cleaners. Moreover, if your ‘patch’ is in a city then expect competition. So, who else is getting in to the window cleaning industry? Well, apart from the groups already mentioned there is a definite trend for SME office cleaning companies (Small and Medium Enterprises) finding profits are much more reduced in their sector. They are now looking into window cleaning as a source of greater wealth. An increase in SME, ‘office cleaning’ type companies have already began the transition from once having 80% of their business as office cleaning and 20% as window cleaning (sometimes subbed out) to reversing that completely. They are investing in water fed pole systems and training for their staff. The SME companies are finding that they are loosing larger clients to national cleaning companies. The nationals and bigger cleaning companies are on an aggressive sales drive in order to beat the recession and in many cases dropping their prices to snare these contracts. The returns and profits for office cleaning has been eroded over the pass 5 years. Labour costs and all associated costs have risen year on year, however, some SME have neglected to increase their prices accordingly to stay competitive in an uncertain market. The profits to be made in window cleaning far out strip the profits in office cleaning. The trend of these SME companies in a lot of cases are to eventually drop office cleaning and market the business into window cleaning 100%! He is planning to change the livery on his van to 100% window cleaning services. He was fed up of earning a couple of quid per hour worked and the unsociable hours. 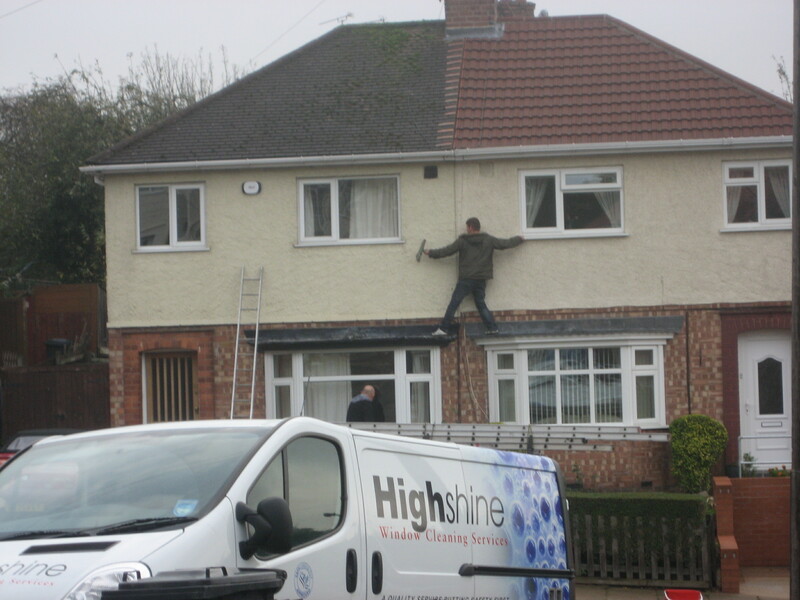 The squeeze on his profits has opened his eyes to window cleaning. He could send a window cleaner employee out, pay him £10 per hour, and still pocket another £15.00 per hour on top of that! In the words of Sir Alan Sugar, ‘…it’s a no brainer, really’. These office cleaning companies have been running their business for years. They have well established marketing techniques, health & safety systems, and websites and are primed for winning work. Window cleaning work! So, you have the redundancy group, the looking for a job group, the topping up the money group and the office cleaning companies turned window cleaners group. Some of these groups are having 40,000 leaflets printed at a time. To understand how that translates, take the City of Nottingham. Nottingham has a population of approximately 360,000. It would only take eight new window cleaners armed with this quantity of leaflets to cover everyone in Nottingham! If this increase in trend continues, this will affect you one way or another. It will effect you maybe a lot or maybe very little. So what type of window cleaning work will be most affected? Residential window cleaning is set to go through a harsh time. It is the most easiest to obtain – even in hard times. All the groups will aim for this area of window cleaning. The SME office cleaning group will still seek commercial work as well as resdiential because that is where they feel they belong but the sales and efforts involved are slow and sluggish. Commercial window cleaning, although more profitable than residential is still the ‘commercial sector’. The sector cutting down on its office cleaning. It is going to be slow to build up a sales target based on these alone. Ultimately, sales is a numbers game. The current market conditions will mean you will have to ring many more numbers. For some reason, commercial window cleaning holds good pricing even in view of poor economic times ‘per clean’, however, commercial companies may save by extending the regularity of cleans and in a lot of cases excepting a slightly higher cost for less frequent cleans – but still a lower cost annually. In some cases, the commercial sector are finding times are tough and are more likely to down grade their window cleaning regularity with an existing supplier than go with somebody new. So, it looks like the easy market of residential window cleaning is a prime target! So, what can you do to win? Now is the time to act. If you have seen new window cleaners turn up in the street that you clean (areas differ) then this should act as a warning sign for you and prompt you into action! Self-analysis is so important. USP is the key. Re-look at how the public see your business. From your business cards to your website, to your van and equipment. Get yourself uniformed and/or re-launch yourself. Get 20,000 leaflets and drop them in your round area to support your existing round and to gain new customers for any you may loose. Get feed back from your customers and look for ideas in the forums, no matter how crazy they may seem. For example, if somebody is sounding off and telling you that they have set up an online payment system to help their customers have a greater choice of payment options, that it works and they have won work by it. Do not stick your head in the sand. Look at all the ideas and pick what works for you. Add services that a window cleaner with ladders cannot do, such as solar panel cleaning. Start to add extra services such as roof cleaning, driveway cleaning, become a one-stop shop for residential properties. I will discuss how you can win in a later article. If you have ideas on how to keep ahead of the game write me a letter and email me lee@windowcleaningmagazine.co.uk we will publish the best. ← Is it time to give scrims a miss?